I'm not a fat man. Though I'm working my way up to it. It doesn't help that 2 of my past 3 reviews have been for burgers. But I digress. I'm gonna come right out and say it, Carl's Jr is a sexist fast food joint. Not that there's anything wrong with that. They know their audience (18-44 year old dudes who haven't yet had a heart attack. I stress "yet") and they advertise solely for their target market. I actually thought it was a joke when they started advertising a atkins-friendly lettuce burger. They forgot who their customers were, either that or wanted them to survive a little longer to buy more greasy burgers. Honestly, I've never seen a girl eating at Carl's Jr. Well, a girl under 200 pounds that is. Now, it sounds like I'm hating on Carl's Jr. Don't let my comments fool ya, I am a fan. They're not in my top 3 fast food joints, but they are usually the only one open after 10. (I should maybe change my eating habits) Carl's Jr has their normal assortment of artery-clogging burgers and from time to time they introduce a limited product. These limited items last for about 2 months on the menu. They get you to like them then they take it away. Burger-tease! 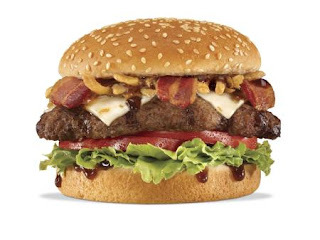 Some recent limited items have ranged from a typical chili burger to a jalapeno avocado western ranch burger. The most recent heart attack diagnosis is the Kentucky Bourbon Burger. I'm gonna come right out and say it. It's freakin' delicious! The burger patty is near quality, which is leaps and bounds better than your average McDonalds cardboard. The Bourbon sauce is fantastic. It's tangy in all the right places. It also has pepper jack cheese which is the best thing to happen to cheese since string cheese. Let's not forget the tiny onion straws that top it all off. Nothing like fried food in a greasy meat patty. After all this talk and you might think I have developed a little burger crush on the Bourbon. That might be true. It's just sad that our blessed relationship will only last for another month and a half. I'm not saying it's a perfect burger, I'm docking it because you still get that stale Carl's Jr. aftertaste and it will do a number on your stomach, but it's all worth it. I'm giving the Kentucky Bourbon Burger four famous stars. I wish we had a Carl Jr.'s around here, but alas we only have Mickey D's. Blech.